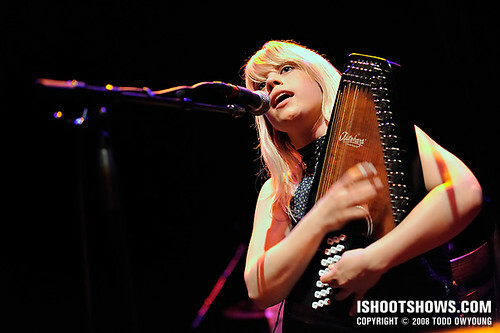 In a set that ranged between soulful pop and lilting, vibrato-tinged folk, Ontario's Basia Bulat ripped though a spirited and undeniably charming performance opening for Devotchka at Terminal 5 in NYC. Lending credence to her Myspace page quote, which promises, “More fun than your very own pony,” the bubbly singer seemed to win over more than a few converts in the New York crowd, which gradually warmed from polite applause to a full out percussion-section hand-claps through the course of the set. 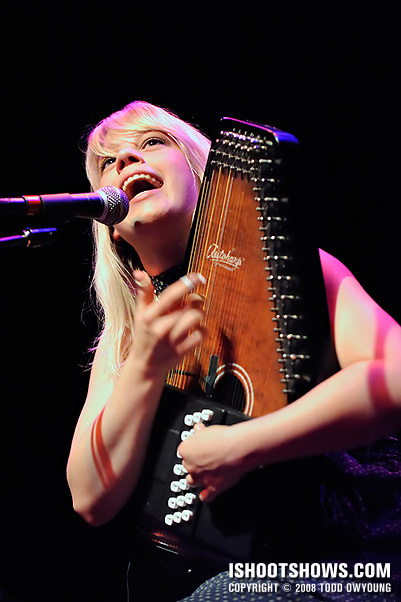 Whether her fingers were flicking across the strings of her effervescent Autoharp or her acoustic guitar, Basia's smokey voice and impassioned delivery carried throughout her set. The band was positioned about a meter back from front of the stage, and Basia herself was surrounded by various stands, which made clean shoots an interesting challenge. 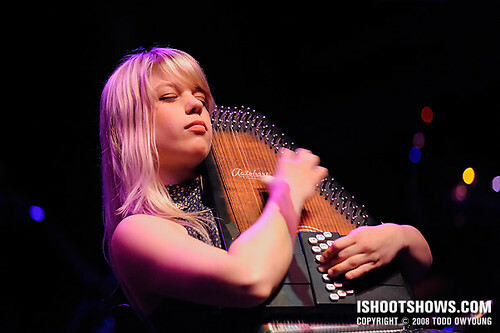 Upping the challenge were Basia's movements while rocking the Autoharp (quite literally). While not singing, the musician often clutched her harp to her body and quickly swayed back and forth with the instrument, her fingers flying across the strings all the while. For her first, short a cappella song on stage, Basia was lit dimly light from the front. 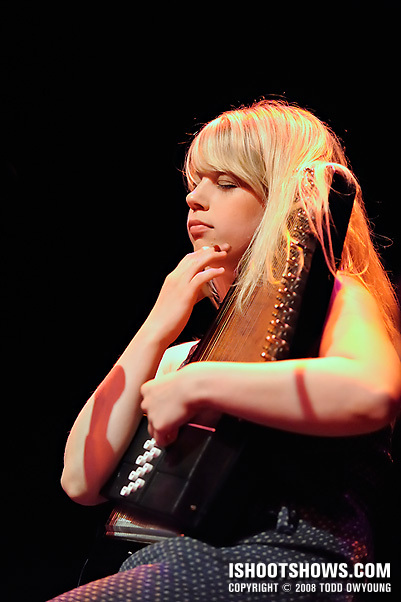 For the second song, seated with her Autoharp, the singer was given a very warm treatment from the front, with magenta accent lighting from the back. By contrast, the other musicians in the group were given far dimmer treatments of orange-magenta casts. 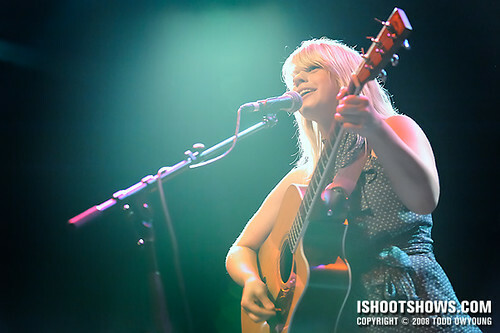 For the final song of the shoot, the stage brightened up with stronger, pale backlighting in contrast to the same warm frontlighting of the previous songs. I shot primarily with the Nikon 70-200mm f/2.8, the range of which helped make the most of the narrow, clean lines of sight. The Nikon 24-70mm f/2.8 made a brief appearance for the obligatory wide stage shot, but was otherwise left unused for this set. Since the shifts in lighting were generally small, I shot this set in the narrow range of 1/125 to 1/160 at f/2.8 and ISO 6400. Bulat's fast strumming of the Autoharp certainly could have benefited from a faster shutter speed of 1/200 or 1/250, but light simply wasn't on our side. In a rare opportunity, I also photographed Basia for a second time on her tour with Devotchka when she performed at the Pageant three days after this NYC date. 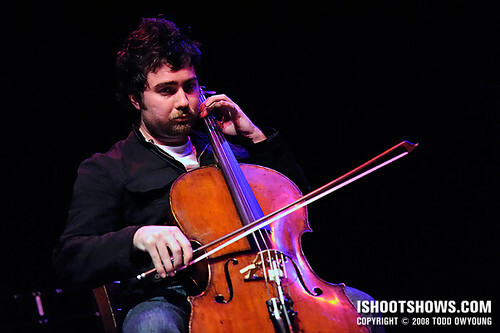 Stay tuned for those images, as well as images from Devotchka's Terminal 5 set, coming up soon. Also, check out Basia Bulat's beaming video for “In the Night,” which shows that an after-hours romp through the woods can be more fun and cheerful than you ever imagined. I’m really hating myself for missing the Devotchka show now. Hey Lauren! What I caught of it was fantastic. Luckily, I shot both Devotchka and Basia a few days later on my home turf, which made for an interesting double-dipping experience. 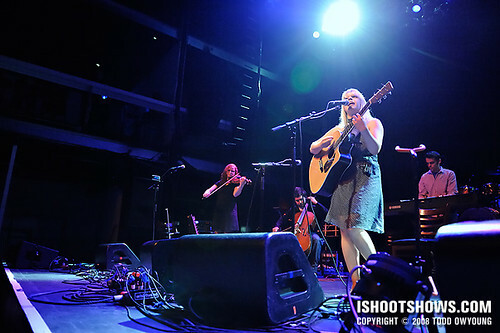 I’ll be comparing the two shoots in the Pageant write-up for Devotchka, but I should be posting their Terminal 5 shots on Thursday or Friday. Thanks for yours comments and descriptions about metring and exposure. This is very helpfully. I’ll be back. Thanks very much for the kind words, I’m constantly looking to make ishootshows.com a better and better resource for concert photographers. Also, it’s nice to hear you understand my passion. We music photographers must all have the same disorder. Please let me know if there are any articles or features you’d like to see here. I’m waiting for you cover-up from She Wants Revenge, LAdytron, Iron & Wine (there’s a chance that I’m going to photograph them in August so I’m curious what kind of a band they are:), Tom Waits and Modes Mouse! judging by the photos this was a really slow, nice and atmospheric gig! one more thing I wanted to ask you: why do you use the wide angle so rarely? Hey Frota, thanks for the feedback. 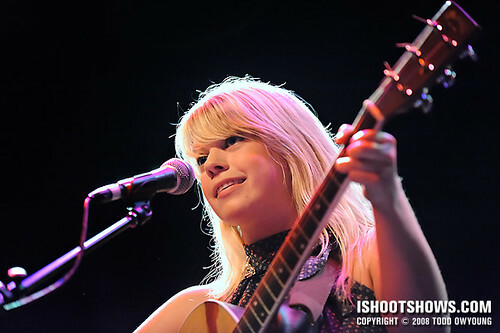 This show with Basia Bulat was pretty mellow, but it still had a nice, upbeat vibe at times. But definitely low key. I think WordPress must automatically add .com unless you specify another domain. 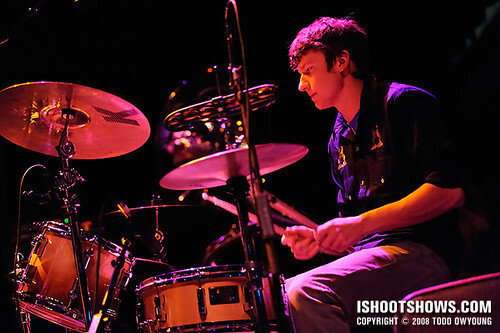 I do enjoy wide angle shots for my work, but it all depends on the positioning of the band on stage. For this gig, the band was all relatively far back, so a wide-angle shot didn’t really benefit the performers. I’m much more inclined to go wide at rock shows when a guitarist comes up to the edge of the stage, puts their foot up on a monitor, and starts shredding (as a hypothetical example). Still, I use my 14-24mm f/2.8 whenever I can. Stay tuned for images on those shows you listed. I’m particularly looking forward to Ladytron and She Wants Revenge/Be Your Own Pet. I’d like to catch Johnny Marr with Modest Mouse, too. Hey Brah, I love #3 and #4. It was great shooting with you again. I took a peek at your DeVotchKa set and I can’t wait to see the STL vs. NYC comparisons. Hey Chris, great shooting with you, too. It would have been nice to shoot Dream Theater, too, but I’m not complaining, because I do love me some Yakitori Totto. Thanks for the picks in this set. Regarding the comparison between the Pageant and Terminal 5, I may even break that out into a separate post, we’ll see. There are certainly pros and cons to each venue, though there are also an appreciable number of similarities. It’s interesting to note the differences in WB between everyone’s shots for Basia and Devotchka as images from this show are posted, too. I love the leading shot. It has this surreal quality to it. Great job workin that lighting. I dont know how you do it. I do have a random question for ya. How do you focus with you D3? Do you use the 51 points where the cam selects based on the scene, or do you use a different method? Just curious. Hey Keith! Nice to hear from you. Thanks for the feedback on this set! The lighting/feel for the lead shot is definitely what set it apart from the rest, and what prompted me to choose it to kick of the write-up. The lighting must have only picked up for a few moments before dying down again, because I only have a few shots with that nice, airy effect. Regarding focus, in spite of the epic 51-point AF system, I mostly end up using the center AF point. After acquiring the focus I want, I simply recompose. I should note that I also use the rear AF-ON button on the D3, which separates the shutter release from focus activation. Thanks for that info, Todd. I only have 5 on my d70s so I move those around a little bit. I usually use the center point when I borrow cameras that are really complex. It seems to work well. Again, that first shot is a real winner. Cool set! Without exception for the camera’s I’ve used, the center AF point has always been the most precise and reliable. I do use the outer AF points on the D3 a bit more, but I’m just as likely to focus-recompose, too. Todd! I agree with Keith on the first photo. I additionally like 1, 6, and 8 after the jump, but I can certainly see how it was hard to capture he strumming hand. Regardless, the expression in her face on 1 as she sings is great – she looks so into the music and so happy. I also like the violinist in the complete set at the bottom… nice work! How’d you get the gig shooting in NYC? Just visiting your brother for a quick hello? Hey Chris, thanks! 1+8 you picked out are some of my favorite shots, thanks for the selections. I found clear shots like #1 few and far between – that is, with the kind of clear separation between her face and the mic that I prefer. As for NYC, yeah, I was visiting my bro. As soon as my travel dates were confirmed, we checked out concerts we could shoot together and I just wrote Devotchka’s publicist, who took care of credentials.